Dorothy Crowfoot (1928) came to Somerville College to read chemistry, one of only four scientists at Somerville in her year. From the start her interest was in crystallography and in 1932 she was published for the first time, when ‘Layer-chains structures of thallium di-alkyl halides’ appeared in Nature. She graduated with first class honours and moved to Cambridge University as a research student, gaining her PhD in 1935. Dorothy took up Somerville’s offer of a fellowship and moved back to Oxford in 1934. She was one of the first fellows at the College to be married and in 1938, not only the first fellow at Somerville to start a family whilst in post but also the first woman to receive maternity pay at Oxford University. 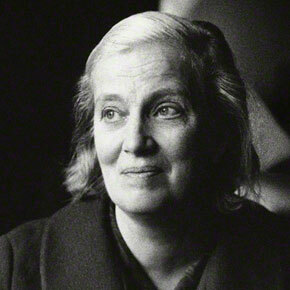 Dorothy Hodgkin was appointed to a University Readership in 1955 and became Wolfson Research Professor in 1960. Throughout her career at Oxford she was a fellow of Somerville College and after her retirement was appointed an Honorary Fellow. During her career at Oxford, she carried out pioneering work on the structure of insulin, vitamin B12 and penicillin. Her work was recognised with many distinctions during her career, starting with fellowship of the Royal Society (RS) in 1946, the RS royal medal in 1956, the Nobel prize for chemistry in 1964 and the Order of Merit in 1965. She remains the only British woman scientist to have won a Nobel prize. In 1970 she was elected Chancellor of the University of Bristol, an honorary position that allowed her to continue her work at Oxford until her retirement in 1977. She was also active in various political causes, most notably the Pugwash campaign against nuclear weapons on whose behalf she travelled all over the world. Somerville holds an annual Dorothy Hodgkin Memorial Lecture in March (to coincide with the International Women’s Festival) and has had many notable speakers over the years. The 2010 lecture, given by Professor Elspeth Garman is available to watch on YouTube. The 2012 lecture, delivered by Professor (Sir) Venki Ramakrishnan, is also available to view on YouTube. You might also like to view the List of past lectures (up to 2011). A Somerville College crowdfunding project to support early career women scientists in the name of scientist and Nobel Prizewinner Dorothy Crowfoot Hodgkin.